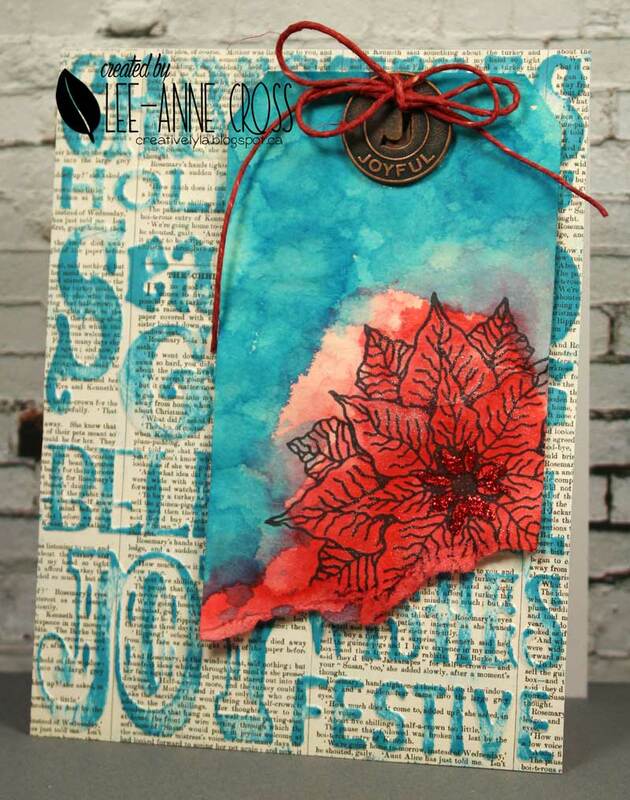 It’s my second week as Guest Designer over at the Splitcoaststampers color challenge. We are playing with Tempting Turquoise, Primrose Petals and Real Red. I’ve used similar shades of Distress Inks. And for dessert this week…a tag. The background has added texture. It was made by dry embossing some designer paper with a Tim Holtz embossing folder and then gently running some Distress Ink over it. I’ve added Distress Inks used as watercolor to a torn manila tag that’s been stamped with the poinsettia. For a bit of sparkle, there’s some Wink of Stella on the entire poinsettia and some Stickles on the center. A little bow and Tim Holtz charm complete the tag. I'm totally smitten by this, Lee-Anne! I'm loving all the distressing and the color combo is absolutely gorgeous! Love your vibrant tag! Great way to make it more unique by tearing the edge! Thanks for joining our challenges at Happy Little Stampers. Phenomenal! Love the torn tag, love the gorgeously colored background stamping! Awesome card!!! A lovely combination of festive colors in this tag. The rich berry poinsettia looks wonderful against the blue washed bkground. Love the text print with the colorful embossed words. TFS & playing in the HLS November Christmas Tag challenge.